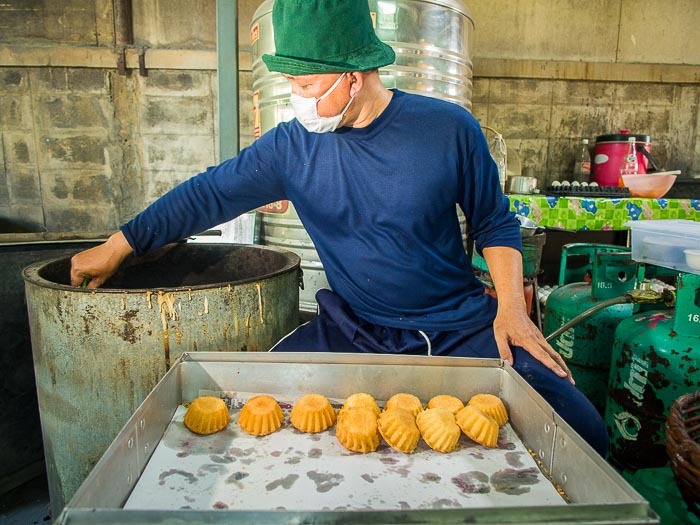 A worker at Pajonglak Maneeprasit bakery pulls cakes out of an oven. The bakery has worked out of the same house in the Thonburi section of Bangkok for more than 240 years. Bangkok is an amazing city. Sometimes challenging, sometimes infuriating, usually for the same reasons (traffic is so bad it can take an hour to drive from our apartment to the shopping district less than five miles away), it's also a city of surprises that reveal themselves in different ways everyday. I recently went for a walk in Thonburi, a part of Bangkok on the other side of the Chao Phraya River. Thonburi briefly served as the capital of Siam (as Thailand was known until the 1930s) under King Taksin the Great. Taksin put Siam back together after the Kingdom was destroyed by Burmese invaders who sacked the imperial capital of Ayutthaya in 1767. Thonburi's fortunes faded after the death of Taksin when King Rama I (Buddha Yodfa Chulaloke) moved the capital to Bangkok in 1782 (Taksin's reign was short). Thonburi is a warren of narrow sois and ethnic neighborhoods. Thai Catholic communities are next to Muslim communities and Chinese Buddhist communities and of course Thai Buddhist communities. 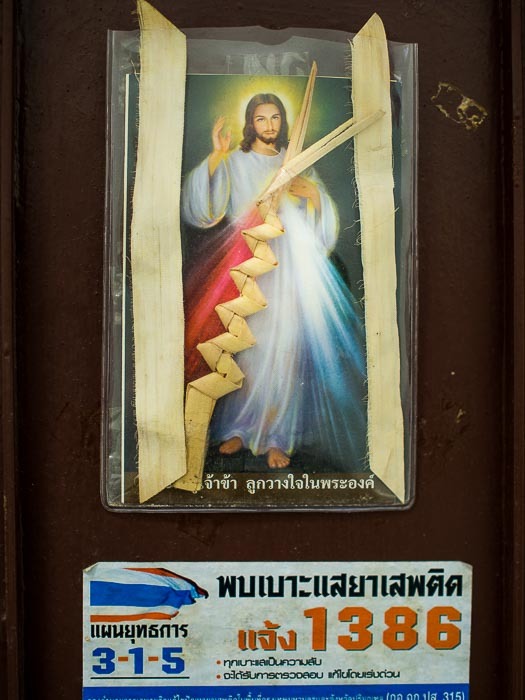 The door of a Catholic home near Santa Cruz Church. I took a ferry to Santa Cruz Church in Thonburi. Santa Cruz is the center of a community of Thai Catholics. Catholicism has a surprisingly long history in Thailand. Portuguese Catholic priests accompanied Portuguese soldiers who came to Siam in the early 1700s. The Portuguese fought alongside the Siamese (Thais) during the Burmese wars and were allowed to practice their faith. The Portuguese married Siamese women and some Siamese converted to Catholicism. I don't normally trespass or just walk into people's homes, but I spotted a sign that simply said "Open" over a door so I wandered in to see what was open. I had wandered into a small family run bakery. 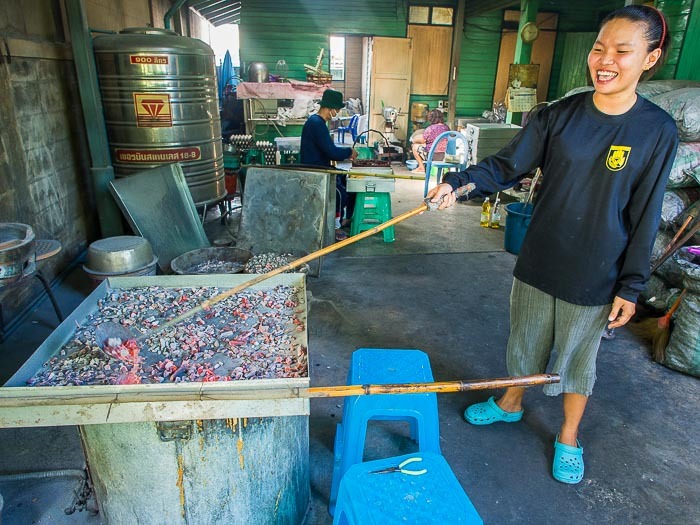 There were about eight people mixing batter, filling small ovens and packing small bags of cakes called "Kanom Farang Kudeejeen." No one in the bakery, which was really a family's front porch, spoke English, but I was invited to wander around and photograph. So I did. A worker covers an oven in hot coals. The ovens are heated from the bottom by natural gas, hot coals are put on top of the oven to brown the top of the cakes. The bakery uses a recipe that originated with the Portuguese - eggs, flower, sugar and water. No baking powder. I've been in bakeries in the US - places with giant commercial ovens that turn out tons of baked goods every hour. This was not that. There are two ovens, ancient looking cylindrical affairs with natural gas heating from the bottom. When cakes are in the oven, a metal pan is placed on top and hot coals, from charcoal braziers scattered around the floor (watch where you step), are placed on top of the ovens to brown the cakes. A women sat on a stool a few inches off the floor hand mixing batter. Children watched TV while other workers packed cakes hot out of the oven or poured batter into cupcake like cups. It's almost always hot in Bangkok, but between the ovens and charcoal braziers in a very small space the bakery was stifling. It was not quite a beehive of activity, but people were always in motion. Either filling ovens, or dropping raisins onto cakes baking in the ovens, or mixing batter or packing the fresh cakes, there was always something for someone to do. 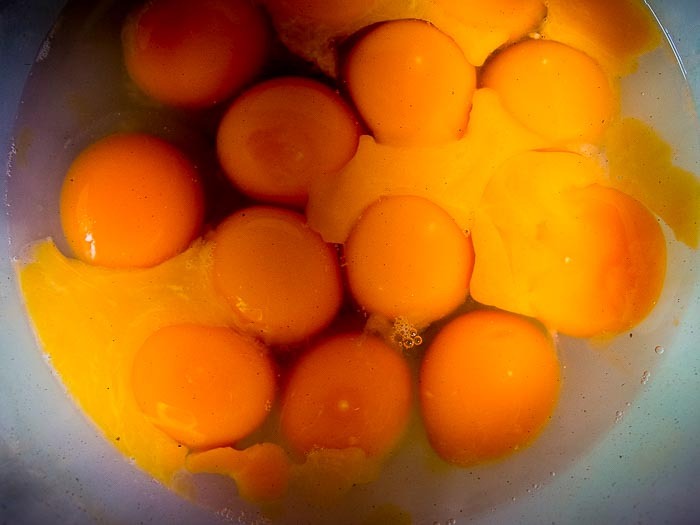 Fresh eggs wait to go into the batter. I spent a couple of hours in the "bakery" photographing people hard at work. To me this is what Bangkok is all about. It's a city of 12 million people but get out of Ratchaprasong or away from the touristy sections of the city and you're transported back in time to what I imagine Thailand was like when it was called Siam. There are more photos from the bakery in my archive or available from ZUMA Press.